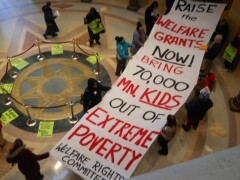 Welfare Rights Committee demands MN legislators “Raise the welfare grants now!” | Fight Back! This session, the Welfare Rights Committee has a bill in the Minnesota legislature to increase the welfare grants - Senate File 1693/House File 2191. The protesters marched with the banner to Governor Mark Dayton’s office, filling both his inner office and waiting room, as WRC members reminded Dayton it’s time he raised the welfare grants for those most in need and help take 70,000 Minnesota children out of extreme poverty.